Economic and market forecasting is a mug's game. But that doesn't stop economists and strategists from making forecasts. At this time of year, I use a variety of sources to assemble a consensus view of economic and market outcomes for the year ahead. The turn of the year is always peak season for marketing investment themes based on year ahead forecasts. I'll review 2015 forecasts in a forthcoming post, but first, lets take a look back at 2014. 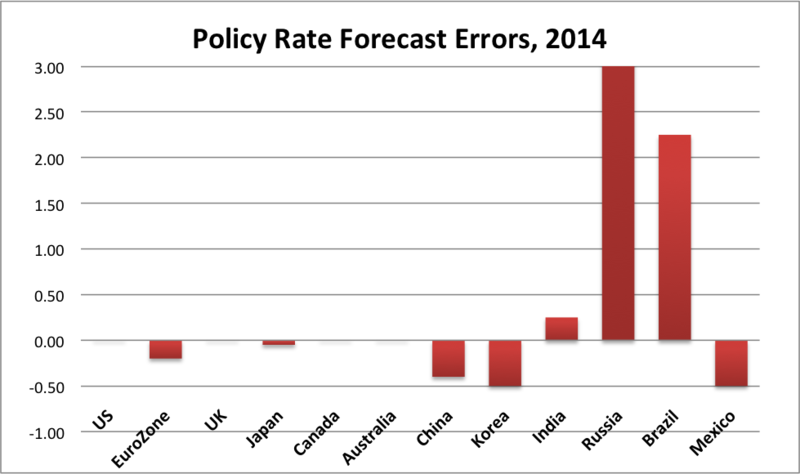 In particular, let's look at the notable global macro misses and the biggest forecast errors of the year. I have mentioned in previous posts that, since the Great Financial Crisis, forecasters have tended to be over-optimistic in their real GDP forecasts. That was true again in 2014. In the twelve major economies we track, real GDP growth fell short of forecasters' expectations in seven and exceeded expectations in just two countries. The weighted average forecast error was -0.3 percentage points. Current estimates of real GDP growth for the two largest economies, the US and Eurozone, fell short of forecasts by 0.2 pct pts. The biggest misses were for Brazil (-1.9 pct pts), Japan (-1.3), Russia (-1.2) and Mexico (-1.2). Canada and India beat forecasts by 0.3 pct pts and China by 0.1. On balance, it was a fourth consecutive year of global growth trailing expectations. 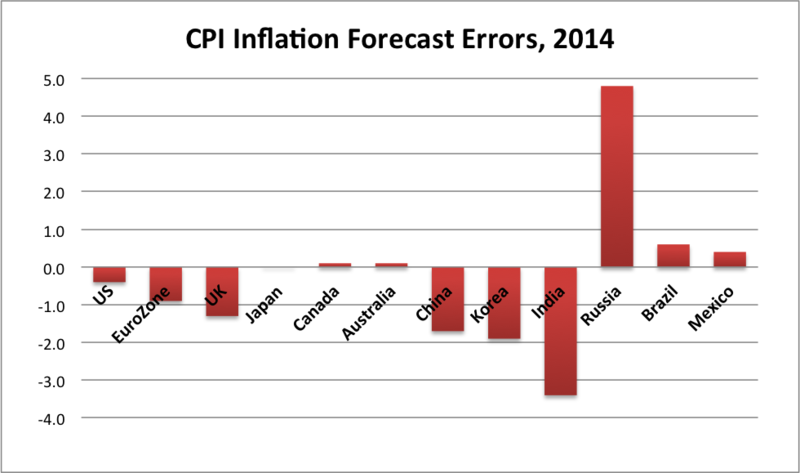 Inflation forecasts for 2014 were also too high. Six of the twelve economies are on track for lower than forecast inflation, while inflation will be higher than expected in five countries. The weighted average forecast error was -0.8 pct pts, a significant miss highlighting the disinflationary pressures that continue to dominate across the global economy. The biggest downside misses on inflation were in Emerging Asian economies including India (-3.4 pct pts), Korea (-1.9) and China (-1.7). These countries were joined by big DM economies including UK (-1.3), Eurozone (-0.9) and US (-0.4). The upside misses on inflation were in countries that experienced large currency depreciations, including Russia (+4.8), Brazil (+0.6) and Mexico (+0.4). Economists' forecasts of central bank policy rates were close to the mark for DM economies, but there were some notable misses for EM economies. In the DM, the ECB and the BoJ made small policy rate cuts that were not expected a year ago. The misses on central bank policy rates for there emerging economies were mixed. The biggest misses were for Russia, which is literally off the charts, at +11.5 percentage points, and Brazil at +2.3 pct pts, both economies where the currencies suffered sizeable depreciations. In emerging economies where inflation surprised to the downside and currencies were firm, the central banks cut their policy rates more than expected, as in Korea -0.50 pct pts and China -0.40. 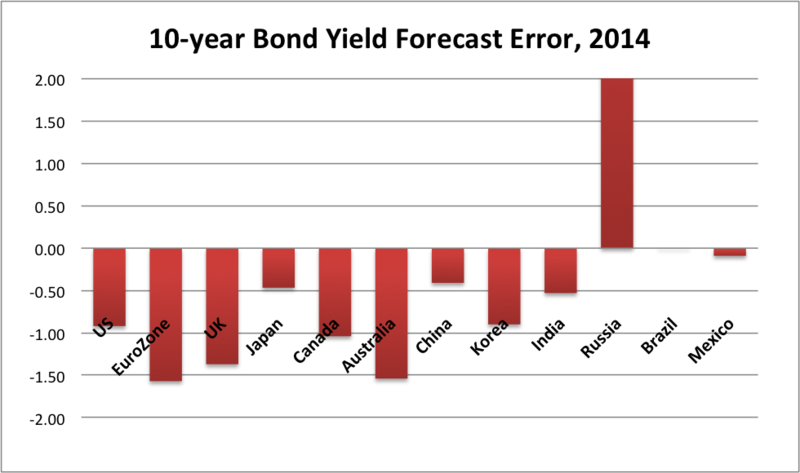 In 10 of the 12 economies, 10-year bond yield forecasts made one year ago were too high. The deflationary forces at work in the Eurozone and China pulled 10-year yields down almost everywhere compared with forecasts of rising yields. In all of the DM economies we track, 10-year bond yields surprised strategists to the downside. The weighted average forecast error was -1.10 percentage points. The biggest misses were in the Eurozone (-1.57), Australia (-1.54), UK (-1.37), Canada (-1.04) and US (-0.92). The only exception to the downside misses was Russia, which again was off the chart, with an upside surprise of 5.65 pct pts. The strength of the US dollar surprised forecasters. 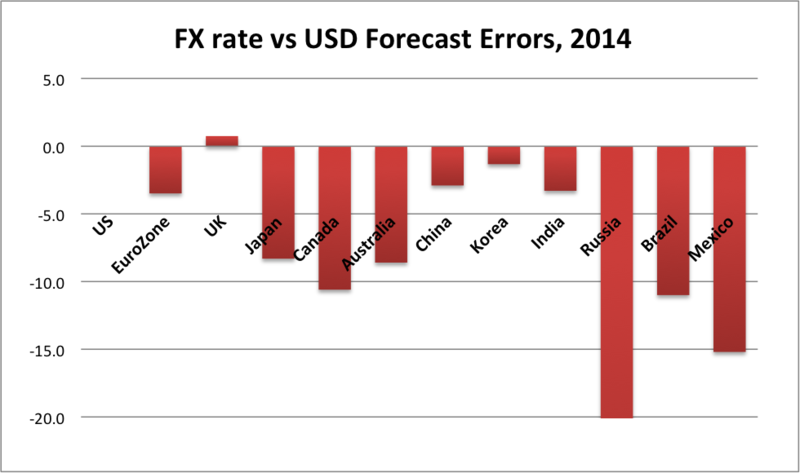 To be fair, the USD was expected to strengthen against most currencies, but not by nearly as much as it did. On a weighted average basis, the 11 currencies depreciated versus the USD by about 6.5% more than forecast a year ago. The USD was expected to strengthen because many forecasters believed the Fed would begin to tighten by the end of 2014. While the Fed has been edging toward tightening this year, it has found various reasons to delay, with tightening now not expected to begin until mid to late 2015. If everything else had been as expected, this would have tended to weaken the USD. But everything else was far from as expected. The ECB, the BoJ, and even the PBoC eased monetary policy, something no economist forecast a year ago. On top of that, oil prices collapsed and other commodity prices weakened so that commodity currencies like RUB, MXN, CAD and AUD weakened more than forecast. The biggest FX forecast miss was, not surprisingly, the RUB, which again was off the charts, more than 40 percentage points weaker than forecast a year ago. Other big misses were for MXN (-15.2 pct pts), BRL (-11.0), CAD (-10.6) and AUD (-8.6). GBP was the only currency that depreciated less than forecast versus the USD. 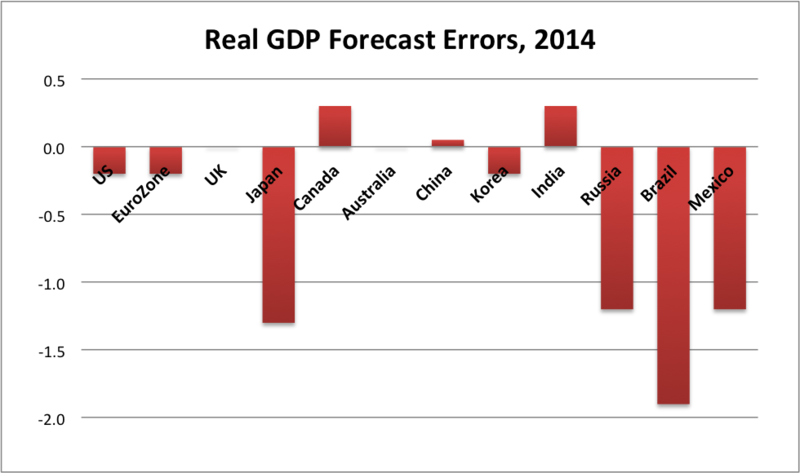 The investment implications of the 2014 forecast misses were substantial. First, global nominal GDP growth was about a full percentage point weaker than expected, reflecting downside forecast errors on both global real GDP growth and global inflation. This would normally be bad for equity markets, but the weaker nominal GDP and profits growth was offset by easier than expected global monetary policy. US equities performed well in this environment, as did markets where central banks provided unexpected easing. Second, the downside misses on growth and inflation and the central banks' responses resulted in a strong positive returns on government bonds, the opposite of what the majority of strategists forecast. Third, divergences in growth, inflation and central bank responses, along with the sharp declines in crude oil and other commodity prices, led to much larger currency depreciations versus the USD than forecast. For Canadian investors, this meant that investments in both US equities and US government bonds, leaving the currency exposure unhedged, were big winners.